Algae reproduce by means of vegetative multiplication, asexual reproduction and sexual reproduction. Fission: It involves simple mitotic division resulting in the formation of two daughter cells. The cell separated and grow to the size of parent ceil e.g., Unicellular members of Cyanophyta and Chlorophyta. Fragmentation: In some species, few or many-celled segments called fragments. break away from the parent filament that grow into new filaments by cell division. E.g., in Spirogyra. Adventitious Branches: In Chara, certain nodal cells produce adventitious branches which break off from the parent plant and develop into new plants. Budding: Bud is an outgrowth that develops from a cell. It develops into a new plant after separation from parent plant. Asexual reproduction does not involve sexes. It is brought by formation of specialized reproductive units called spores. The motile spores are called as zoospore. Generally, these are ovoid or spherical in shape (fusiform), but in certain cases they are kidney-shaped (reniform). The aplanospores are non-motile spores formed by terrestrial species. E.g., Vaucheria. These are considered to be zoospores that failed to develop flagella. They produce new plants upon germination. In certain algae, e. g., Chlamydomonas aplanospores secrete thick walls to become hypnospores. In members of Cyanophyta and Chlorophyta, the vegetative cells round off and the original parent wall becomes extremely thick to form akinetes. In some cases, the protoplast divides to form spherical units which secrete new walls. These are called endospores. In some species, the cell wall ruptures at distal end and spores are cut off from the exposed protoplast. They are called exospores. In members of Phaeophyta four non-motile spores are produced per sporangium. These are called tetraspores. In Batrachospermum, a single non motile spore called monospore is formed each sporangium. Sexual reproduction involves fusion of two haploid cells called gametes fuse to form diploid zygote. The process of fusion is called fertilization. The gametes may be morphologically identical, i. e., similar in size and structure, called isogametes; differ in size and shape and known as heterogametes. The smaller or active gametes are termed male gametes, whereas the larger or passive ones are called gametes. The gametes may be produced on the same thallus, (monoecious or produce on different thalli (dioecious or heterothallic). The gametes may be produced in ordinary vegetative cells or specialized organs, the gametangia. Generally, the sexual reproduction may be isogamous or heterogamous type. If two gametes, similar and size and structure (isogametes), fuse to form the zygote, it is called isogamy and the sexual reproduction is known as isogamous sexual reproduction. 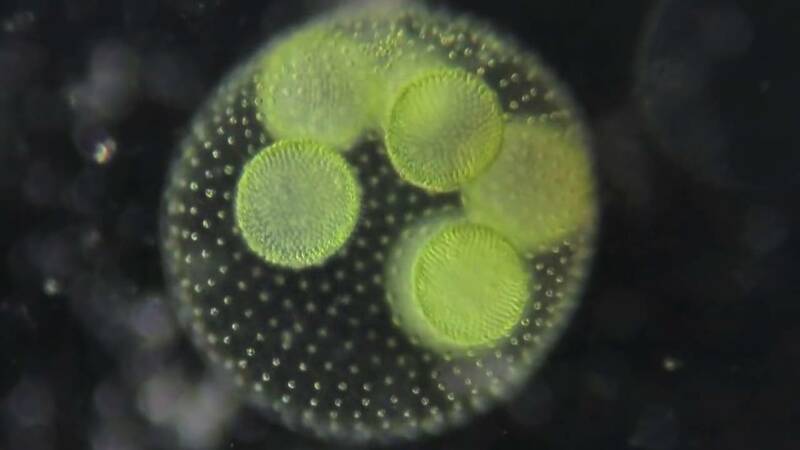 It is simplest and most primitive type of sexual reproduction found among simpler forms of algae. If two gametes, dissimilar in size and structure (heterogametes) fuse to form zygotes it is called heterogamy and the sexual reproduction is known as heterogamous sexual reproduction. It is advanced type of sexual reproduction. The heterogamous sexual reproduction is of two types, anisogamy and oogamy. Anisogamy: It involves fusion of a larger passive gamete (female) and a smaller active gamete (male), for example in Chlamydomonas. The gametes are produced in ordinary vegetative cells usually. Oogamy: It is highly advanced type of sexual reproduction which is characteristics of filamentous forms of algae. The gametes are produced in gametangia. The male gamete producing structures are antheridia whereas the female gamete producing structures are oogonia. A single large egg or ovum is produced in each oogonium and many small, active male sperms are formed in each antheridium.